Upcoming DLC will add "about 50% new content" to Weird-as-all-hell dungeon-crawler The Binding of Isaac. According to creator Edmund McMillen's Twitter feed, the expansion will likely be called The Wrath of the Lamb, which fits snugly with BOI's biblical theme, and cost you around $3. 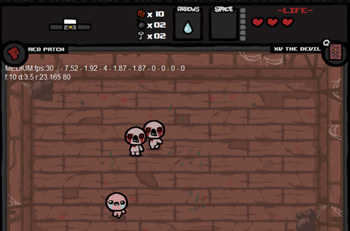 The expansion will add a new class of item called 'trinkets' which are carried items that give Isaac passive bonuses. There will be twenty of them, and they'll apparently turn up during gameplay about as regularly as pills or tarot cards, though you're far more likely to get them from the "fortune teller machine" a rare variant of the current slot machine. The update will also add one new playable character, a host of new enemies and a new final - absolutely final - boss. McMillen also added that his partner for the project, programmer Florian Hisml, of Coil fame, would be looking into upgrading the game to Flash 11 to help alleviate some of its performance issues. Production on the expansion has just started, and it won't see the light of day any time soon, though McMillen reckons it will be finished this year. While the expansion will mark the end of Isaac's story, it won't necessarily make said story any clearer. "Maybe the mega expansion will answer things more," he wrote, "or make them a bit more unclear..."
McMillen is currently answering player questions, as well as dispensing the odd nugget of philosophical wisdom - such as the fabulous; "Gay people are just like non-gay people but more gay" - on Formspring.